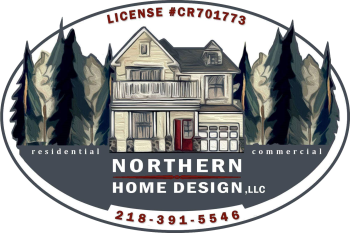 When it comes to general construction, Northern Homes Designs can offer you a complete line of construction from installing new windows, doors, and siding to remodeling or building an addition. We specialize on all the latest in technology from building green to applying the newest technology to keep the cold out and the warmth in. Our staff has years of experience. We will meet with you, go over everything you have in mind and then create a plan to complete your project just as you envisioned. Today, especially living in a climate such as Minnesota, we always need to think about the weather elements and what window design will best serve your home. Double and triple pane windows will offer a great weather enhancing element when it comes to our harsh winters and yet provide insulation within the window structure to keep your home cool in the summer. The design and technology is limitless. Today the doors you choose for your home, garage, and additional buildings come in many unique styles as well as functionality. Once again, keeping the cold out in the winter. From a traditional door, to a breath taking arched door, the companies we work with can offer you an extensive inventory. Wood, steel, aluminum, they all are available in a design that will suit your rooms as well as your outside. From traditional aluminum siding to stucco siding, the choice is yours. Masonry siding has become av very popular look for your home. The one thing you need to make sure is that the installation is being done correctly so not to have a moisture issue later. Wood siding is also a great look, especially here in Minnesota. We can go over all the options and choose the product that will best suit your needs and the look you want. After all, most people only see your home from the outside.